I don't think I have ever been so bummed about writing a review. Really guys, this hurts. Unfortunately, I actually think this review should have been up a long time ago. You see, I started this book shortly after it's release. I managed to get through half of it, but it came to a point in which I just wasn't connecting with the story regardless of how much I actually wanted to. So basically since May, I've been picking it up, trying to power through it, only to put it back down and eventually start the cycle all over again. I've never really had the courage to DNF a book. I don't have anything against it I just always felt so compelled to finish every book I started reading, but I think it's about time that I started realizing that if I'm not enjoying something I should simply put it down and look for something that suits me better. Although, I think my denial for DNF-ing this book wasn't based on that alone. 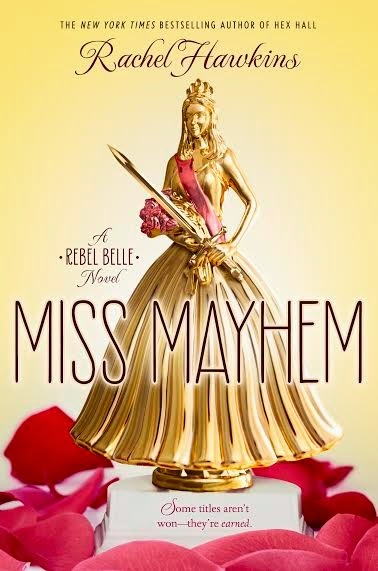 In fact, it was mostly due to the undying and undeniable love that I had for Rebel Belle (and still do). I think this might just be that second-book-syndrome thing that we tend to experience with many series. Straight from the start I felt detached from the characters. It was as if I was reading something completely independent from Rebel Belle. To me this felt like a total filler book. And it really saddens me cause I had such high hopes for it. I mean, I loved Harper and David and all the epic-ness and snarkiness that Rebel Belle had and I just wish I could have gotten that awesomeness from this one too. I'm not going to swear off this series, because I feel like it wouldn't be fair. But I don't think I'll be giving this one another try anytime soon. However, when the release date for the third book gets closer, then I'll be picking this one back up for sure. Good grief! Sorry you didn't love this one!